There are two things that many artists wish for after completing an album. First, they wish they could do it over again, because now that they've done it, they could do it better. Second, they wish they could put at least one other version of each song on the album to show more of its many facets. Some artists actually do re-record albums they've just finished because they're not satisfied with them. And because they have lots of money. Very few, though, chase the latter wish, either because it's too much work, seems too self-indulgent or gimmicky, or maybe they just don't think they can pull it off. Enter Red Rooster and their two-disc project Dose. CD 1 features ten songs all done with some variation of the full-band-and-then-some treatment. It's a great big stew of blues and pop and bluegrass and ethnic (think Mexicali and Klezmer) and "hick-hop" (sort of the Americana man's hip-hop) simmering over an urban fire. CD 2 offers up the same ten songs in dramatically different settings--all acoustic, tempos and approaches altered, much more "back porch" to use the title of the band's first release. The second of the two-CD set harkens back to that first album and the band's beginnings in roots-folk. 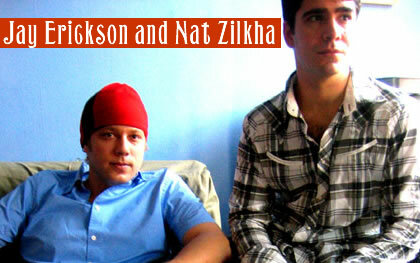 This New York City-based duo of Jay Erickson and Nat Zilkha has come a long way since that first album. They've picked up a bevy of instrumentalists to help them realize the much more ambitious and intriguing vision of Dose. Clarinet, french horn, turntable, piano, electric guitar and Hammond M3 (among others) join the more down home sounds of acoustic guitar, mandolin, fiddle and stand-up bass. The first CD uses any and all sounds, instruments and technologies available to the band to flesh out the edgier, more fiery versions of the songs. The premise of CD 2 is that they can only use sounds that can be transmitted acoustically through a mic. Erickson's deep voice has undergone a maturing since Back Porch, it seems. Always pleasant, on Dose it's more complex with a broader emotional range. But then, the material would demand that. A welcome addition to the vocal landscape of this record is the lovely voice of singer songwriter Charlotte Kendrick. Her light, silky voice complements Erickson's deep brown beautifully and she breathes magic into the song "Dreams" singing lead vocals on Disc 1's version.